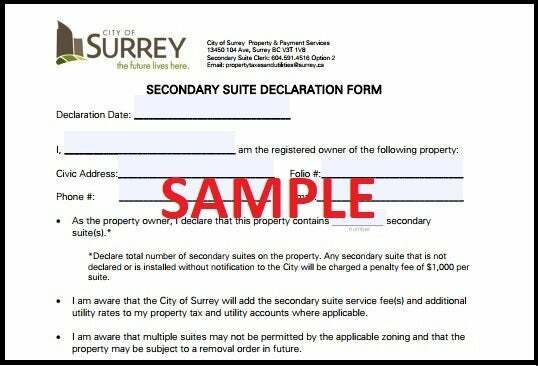 To register, Fill out the complete the Secondary Suite Declaration Form here and submit the signed form to Property & Payment Services by dropping in person at Surrey City Hall or emailing the form as an attachment to propertytaxesandutilities@surrey.ca, or by postal mail. To check if a suite is registered or unregistered use Secondary Suite Fee Online Inquiry. Unauthorized suites may be a source of tension between neighbors and may not offer safe accommodation or security of tenure for tenants, or security of rental income for homeowners who are dependent on this income for mortgage payments. If you'd like to know the value of your Surrey home with a secondary suite and would like a free market evaluation, fill in the FREE MARKET EVALUATION FORM and one of our friendly Agents will get back to you soon! Author Contributor Bio: Donna Fuller is a full time dedicated REALTOR/Managing Broker with Coldwell Banker Universe Realty. Licensed REALTOR in the industry & in the province of BC since 1987.